84 records – page 1 of 2. Photograph of the sod for a new Gordon Presbyterian Church being turned. A crowd of men, women and children are standing outside with their heads bowed. 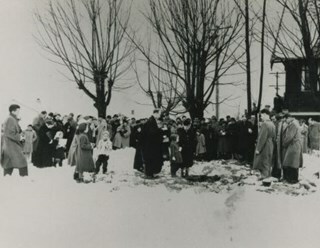 A priest, woman and child are standing at the centre of the group near a patch of turned earth. There is snow on the ground. 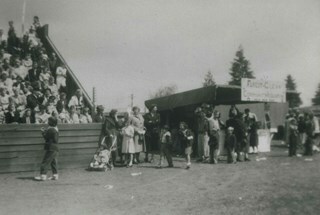 Photograph of a booth at Central Park oval (note the grandstand) set up in order to raise money for the creation of Forglen (Forest Glen) Park. A sign reads, "Forest Glenn Community Association / Help Our Park." Brookes and Paterson at V.L.T.C. 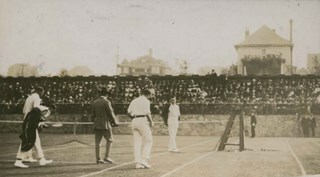 Photograph of a crowd gathered in the stands at the Vancouver Lawn and Tennis Club. On the court are four unidentified men walking towards the stands. The caption "Brookes and Paterson [sic] at V.L.T.C." likely refers to well-known Australian doubles players Norman Brookes and Gerald Patterson. 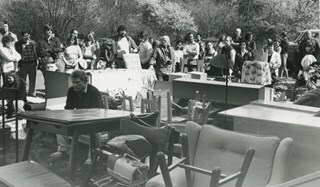 Photograph of a crowd of people looking over the items in the upcoming public auction held on Lillian Mann's property. 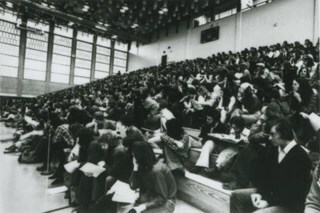 Note on recto of photograph reads: "The crowd looks over Manns possessions." Newspaper clipping attached to verso of photograph reads: "Crowd surveys possessions Lillian Mann collected over 28 years in her expropriated Burnaby home." 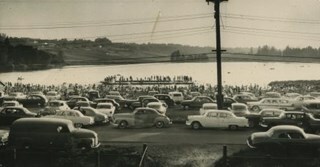 Photograph of people and automobiles gathered at the site of a drive-in theatre for a swap meet. Numerous vendors can be seen with their merchandise displayed on tables and outside their vehicles. The location of this photograph may be the Lougheed Drive-in Theatre as swap meets were held there throughout the 1970s and 1980s. Photograph of people and automobiles gathered at the site of a drive-in theatre for a swap meet. Numerous vendors can be seen with their merchadise displayed on tables and outside their vehicles. The location of this photograph may be the Lougheed Drive-in Theatre as swap meets were held there throughout the 1970s and 1980s. 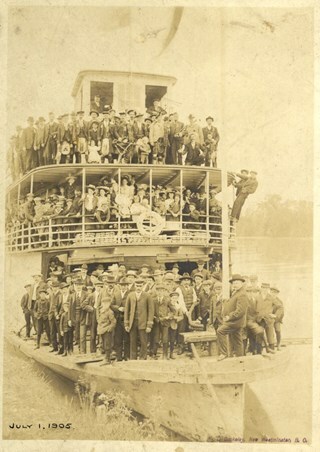 Photograph of a large group of men and women standing on the decks of the S.S. Beaver vessel on July 1st. The S.S. Beaver was a sternwheeler ferry operating on the lower Fraser River. Photographer's mark on lower right corner of image reads: "W.T. Cooksley, New Westminster, B.C." 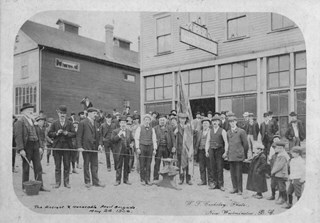 Photograph of "the Ancient + Honourable Anvil Brigade" standing outside a General Blacksmith and Machinist shop. Photographer's mark on lower right corner of image reads: "W.T. Cooksley, Photo., / New Westminster, B.C." Photograph of the beach at English Bay. The beach is crowded an buildings can be seen in the background. Annotation on verso of photograph reads: "English Bay/ 1911." Photograph of Horeshoe Bay. People are walking on the beach, swimming, and boating. 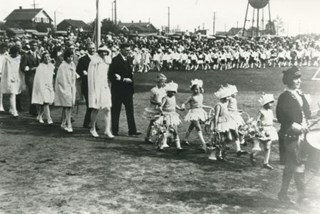 Photograph of costumed children at the Valleyview Community Centre celebrations. One girl is dressed as a cake with two candles. The cake partially reads, "Anniversary / [Valleyview] Fair." There is a crowd watching as the children pass by. 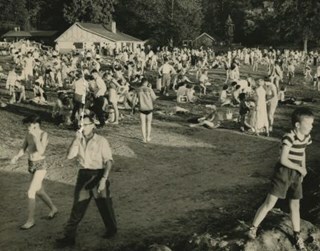 Photograph of a crowd of men, women and children at a beach at Deer Lake Park. Stamp on back of photo reads, "Basil King Photo"
Photograph of Burnaby school children waiting in front of Burnaby Municipal Hall on Kingsway near Edmonds Street to welcome a dignitary (possibly Lord Willingdon or the Prince of Wales). Photograph of May Day activities in Central Park, May 18, 1929. Identified: (5th from right) Maurine Walker, flower girl. Winnifred Jeffery (daughter of Burnaby Constable George Jeffery) was crowned May Queen by outgoing queen, Sylvia Murley (later Sylvia Auvache). Photograph of a crowd of people gathered near the corner of Sperling Avenue and Douglas Road (later Canada Way). A sign in the background reads: "Burnaby By the Lakes Business Sites." 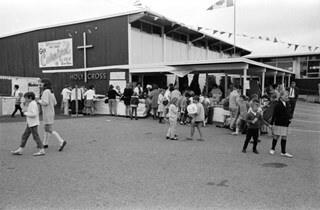 Photograph of a small crowd of children and adults milling around tables set up outside Holy Cross School. A banner on the side of the building reads: "Welcome to Holy Cross Gala Carnival, Sat. June 8th, 2pm-10pm." Photograph of a beach, populated with people, many of whom are in the water. An earlier database record from 2003 notes that the beach may be Kitsilano beach. There is no information to confirm this. In view of the photograph, there is a large two-storey building that is designed as a look out on the second floor. Residential housing can be seen along the bank just above the beach as well. There is a paved foot path running along the bank as well. "Marett & Reid Druggists" store can be seen on the left end of the photograph. Photograph of the old Lumbermen's Arch by the beachside at Stanley Park. There are people gathered by the arch and standing and sitting on logs strewn on the beach. Photograph of 1929 and 1925 Kingsway (later renumbered 7255 Kingsway), Horace H. Palethorpe's real estate office, opposite the former Municipal Hall, Kingsway and Edmonds Street. The crowd is waiting for King George VI and Queen Elizabeth on a royal visit. 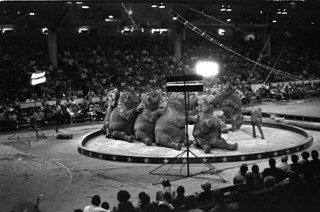 Photograph of a parade of elephants along a street (possibly Granville Street) in Vancouver. Photograph of a large crowd of people and merchants standing in front of the Royal Exchange in London, with the Bank of London visible in the centre. A Pears soap carriage can be seen as can a City Sewer cart. This item was in a scrapbook kept by Claude Hill who was originally from England but ultimately settled in the Burnaby Lake area. 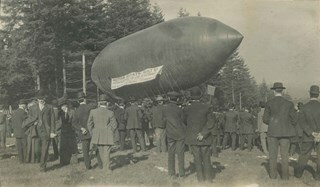 Photograph of a large crowd gathering around an airship in a clearing in New Westminster. The craft bears a banner reading "Motor Boats Built by Hinton Electric Ltd. At Victoria." The airship was piloted by Harry Ginter and made twice daily flights over the 1909 exhibition. Photograph of people and automobiles gathered at the site of a drive-in theatre for a swap meet. Numerous vendors can be seen with their merchandise displayed on tables. The location of this photograph may be the Lougheed Drive-in Theatre as swap meets were held there often throughout the 1970s and 1980s. Photograph of the procession of the bag pipe band at Burnaby May Day, at Robert Burnaby Park. Leading the pipe band is Constable George Jeffrey. A crowd and maypoles can be seen in the background. Inscribed on the negative and printed on the photograph, bottom front: "33 / Burnaby May Day 26. 5. 28 / Lloyd Studio, McKay, B.C." Photograph of a large military ship at a harbour. There are streamers decorating the ship that extend out to the harbour . There are men in navy uniforms on the boat, looking towards the people gathered at the dock. Most people are in suits and dresses. A crane can be seen in the lower right corner of the photogrpah. An annotation on the front of the photo reads: "Leaving Melbourne 1924." Annotations on the back of the photo read: "Arthur Been E.R.A / H.M.S. Delhi / S.S.S. / Y.P.G" and "If it wasn't for trouble how could we appreciate Happinees / AB[underlined]." 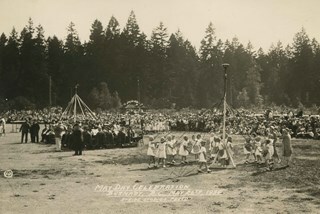 Photograph of a Maypole Dance at a May Day celebration (location and year unidentified). In the photograph, groups of children can be seen around two maypoles. One is a group of all girls, the other group composed of boys and girls, alternating. The girls are wearing blouses and frill skirts with flowers in their hair. The boys are in shirts and shorts. There is a large crowd of people gathered to watch the dance. 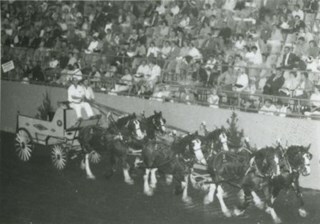 Automobiles can be seen parked behind the crowd. Inscribed in the negative and printed on the photograph, bottom front: "A." The photographs in the accession HV976.143 are thought to be by the Stride studio, as the donor indicated in her letter that the Stride family were personal friends of her great-aunt and her husband, who resided in Edmonds. She wrote that she received a picture of the New Westminster or Burnaby May Day celebrations each year. Photograph of a large gathering of adults and children at Confederation Park for the opening ceremony for the new playground. A man on a pedestal is speaking and a crowd of people are surrounding him. There are six women in front of the gazebo in the centre whose tags spell out CANADA. There are three dogs in the foreground playing, and a Union Jack is flying in the upper right corner of the photograph. It also indicates that there was an inscription on the original photograph that read, "Charlton and Rathburn. / Vancouver. B.C." Photograph of the May Queen and her suite at Burnaby May Day. Girls in white dresses, capes and crowns are lined up in front of a stage with a man in the centre. There is a girl seated on a chair on the back of the stage, possibly the May Queen, and two men are standing at the front of the stage. There are two flags flying: one is a Union Jack and the other flag is unidentified but bears a Union Flag on the upper left corner. People are gathered around the stage. Inscribed on the negative and printed on the photograph, bottom front: "#5 / Burnaby May Day Celebrations / 28/5/27 / Lloyd Studio, McKay B.C." Photograph of folk dancing groups celebrating Burnaby's May Day at Robert Burnaby Park. The dance groups are composed of young boys and girls. Some dance groups are gathered around Maypoles, and a crowd is on a hill by the field watching. Inscribed on the negative and printed on the bottom front of the photograph: "Burnaby May Day 26. 5. 28 / Lloyd Studio, McKay B.C. / 20." 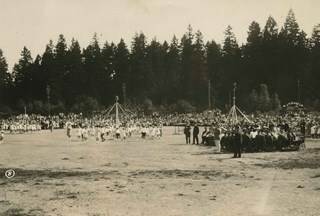 Photograph of several maypoles that have been errected in celebration of Burnaby's May Day at Robert Burnaby Park. At every maypole, there are children (mainly girls), each holding a ribbon. 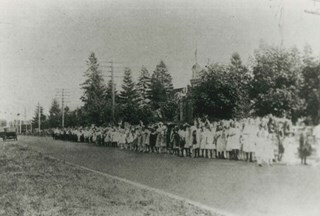 The girls are wearing white dresses and some have white caps. A crowd is watching. 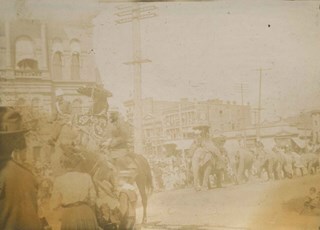 Inscribed on the negative and printed on the photograph, bottom front: "Burnaby May Day 26. 5. 28 / Lloyd Studio, McKay. B.C." Photograph of a group of young men in sailor uniforms saluting the flag at Burnaby May Day at Robert Burnaby Park. There is a large Union Jack laid out on the ground, and the sailors are standing around its edges of the flag. A crowd is gathered behind them. 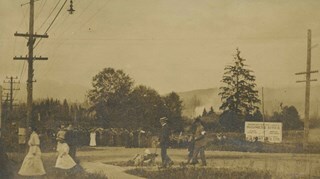 Inscribed on the negative and printed on the recto of the photograph: "Burnaby May Day 26. 5. 28 / Lloyd Studio, McKay B.C. / 25." Stamped on verso of the photograph: "Lloyd's Studio / 3966 Kingsway / McKay, B.C. Carl. 343R2." 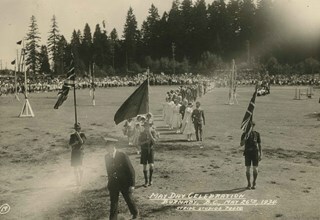 Inscribed on the negative and printed on the photograph, bottom front: "33 / Burnaby May Day 26. 5. 28 / Lloyd Studio, McKay, B. 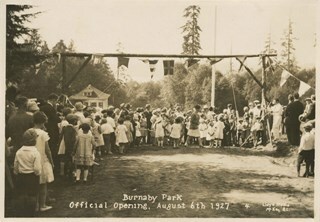 Photograph of the opening of Burnaby Park at the foot of 2nd Street. 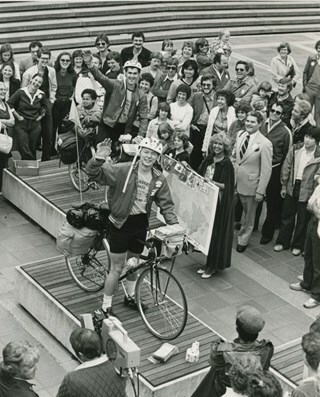 The photograph was likely taken just after the ribbon cutting. Annotation at bottom of photograph reads, "Burnaby Park / Official Opening, August 6th 1927"
Photograph of Burnaby May Day celebrations at Burnaby Park with a band in the foreground and children maypole dancing with a crowd watching. Parked cars and trees can be seen in the background. 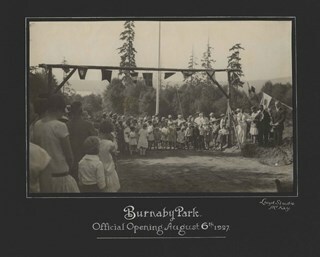 Annotation at bottom of photograph reads, "Burnaby May Day 1930 / Stride Photo"
Stamp on back of photograph reads, "Enlarged by The Stride Studios / 657 Columbia Street, New Westminster, BC / We do picture framing"
Photograph of the official opening of Burnaby Park at the foot of 2nd Street. A crowd is gathered under an arch decorated with flags, and a ribbon is stretched across the arch. Annotation on bottom front of cardboard reads, "Burnaby Park / Official Opening, August 6th, 1927"
Photograph of a crowd on a beach and in the water at Deer Lake Park. Cars are parked in the foreground. 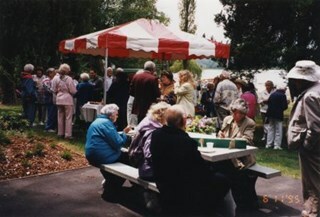 Photograph of Burnaby May Day activities at Central Park. Children are dancing around three Maypoles on a field. A crowd is watching, and a band is seated beside the Maypole on the right side of the photograph. 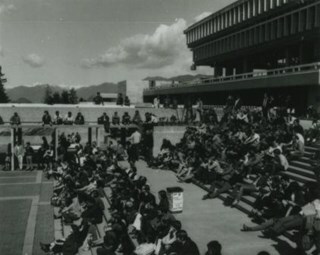 Photograph of Burnaby May Day celebrations in Central Park. There are two Maypoles visible with children around them. A crowd is watching, and a band is seated beside the Maypole at the left side of the photograph. The girls at the right Maypole are standing and looking at the top of the Maypole where their ribbons may be tangled. 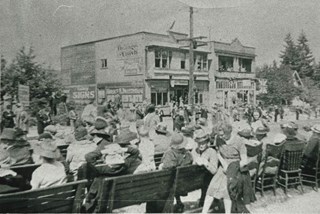 An annotation at the bottom of the photo reads; "May Day Celebrations / Burnaby, B.C., May 26th, 1934 / Stride Studio Photo." Photograph of the Royal Procession during Burnaby May Day activities at Central Park. The uniformed man in the foreground may be Constable George Jeffrey. Three uniformed boys, possibly boy scouts, are carrying flags. Members of the May Day court are being escorted onto the field. A crowd and Maypoles can be seen in the background. 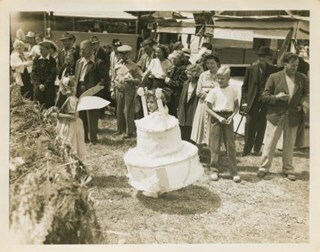 Note printed at bottom of photograph reads; "May Day Celebration / Burnaby, B.C., May 26th, 1934 / Stride Studio Photo." Printed at left of photograph: "19"